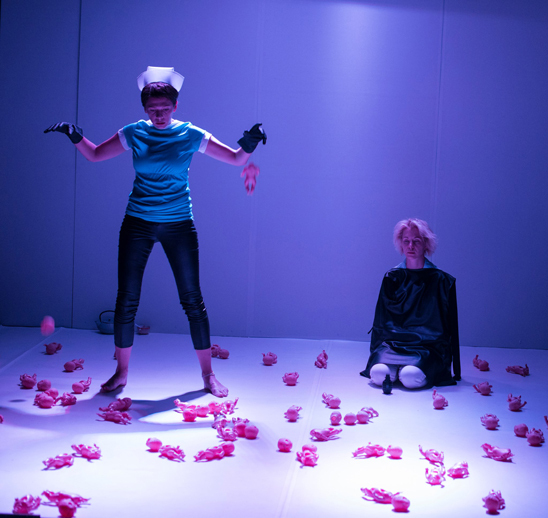 It is strange and awesome to come full circle on a journey that began rather bumpily back in 2011 with a play called, Bechnya, now transformed into Toys: A Dark Fairy Tale, by Samuel French Award-winning playwright, Saviana Stanescu. For L.A. Theatre audiences who have not witnessed the “full-on” Stanescu, it is important to note that Toys has been brilliantly re-imagined by renowned Romanian stage director, Gabor Tompa, into a one act play from a variety of adaptations. Wherein the earlier Bechnya version the story’s characters experience a much more gruesome and haunting beginning-to-end, and the 2011 Los Angeles mounting of this play was entirely convoluted in presentation and direction, here, Toys, which initially formed as a discussion on immigration, takes on a distinctly surreal David Lynchian pastiche. Honest, raw, real and yet not real additionally adorned with a humorous confectionery finale. Immediately recognizable in its evolutionary form, without hyperbole or any stage craft whatsoever getting in the way, Toys plays out an aggressive and occasional “altered states” meeting of two women who have led very different lives, and who undertake a complex intersection to discover their past. An exploration of one’s true identity, cultural heritage and the impact of prolonged war, Toys: A Dark Fairy Tale asks what it means to belong. Instead of keeping to a linear frame, director Gabor Tompa has chosen a more abstract allegorical progression with Stanescu’s original work which according to her, is actually derived from two different plays: White Embers – a one-act that won the Samuel French OOB award and is published in the winners anthology, and Toys – a two-women version of White Embers where Stanescu plays with the American girl being a PhD student in Women Studies interviewing the other one about extremist war, but, where the core adoption story is still the same. Toys focuses on a young woman Clara/Fatma (played by Julia Ubrankovics) adopted as a child from Eastern Europe by an American couple. Shari/Madonna (played by Tunde Skovran) is the immigrant Hashid teacher turned corpse washing nurse who eventually claims to be Clara’s unadopted sister left behind to deal with poverty, war and religious extremism. With Stanescu’s permission and involvement, Tompa has cut parts of the play to make it work and applied his unique directorial concepts that make the piece more ambiguous which remarkably results in a sharper clarity with the presentation overall. Toys is many things: a very real meeting, a dream, an experiment of the alter ego, shared memories, denial, connection, truth. These women are in so many ways opposite sides of the same coin. It doesn’t matter that Shari’s toys are grenades and Clara’s toys are dolls that Shari wants to bury, or that one women has emerged for reconciliation or who knows what reason…“you can’t say ok and everything bad is gone”…, or that Clara can only recall shadows of her young life…”I’m not Fatma, I’m Clara!”…they are explicitly intertwined in every way. As a stand-alone piece, although slightly derivative in a few of its disturbing visual aspects, the composition of this play is beautifully, dramatically off-center, leaving open so much cerebral and physical interpretation and dialog on the subjects carefully phrased inside. Tompa’s non-linear direction brokers far more psychologically-heightened and fascinatingly elliptic relationships for the audience to maneuver and for the characters themselves to inhabit. Toys: A Dark Fairy Tale is bar none, in all its outward simplicity experientially exciting and exceptionally manifested by both director and cast.